The 2400-year-old Acropolis is the symbol of the ancient Greek civilization whose art, literature and zeal for democracy still influence our world today. If you're visiting Greece in the summer, I strongly recommend you arrive at the Acropolis when the gates open (8 a.m.) or in the late afternoon. The midday Athenian summer sun. It can be blistering hot. The Acropolis won't be crawling with two-legged ants (tourists). There will be fewer tourists spoiling your shots. And the low-lying solar rays will give your photographs vivid hues. 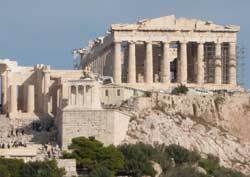 The stunning Parthenon (see top-right section of photo) is the star attraction of the Acropolis complex. The Acropolis offers stunning views of Athens. One of the best viewpoints is near the Nike Temple.